gr-gpredict-doppler is an out-of-tree gnuradio block for getting doppler updates from gpredict into a flowgraph. I’ve written a small python script (based on pyephem) that replaces gpredict for generating the doppler updates. This script allows one to automate scripting the reception of Meteor M2 satellite transmissions while compensating for the doppler shift. dopplerscript is a command-line tool to input satellite doppler shifts into a gnuradio flowgraph. The doppler.py script replaces gpredict as the source for doppler frequency updates in gr-gpredict-doppler, making it easy to script satellite reception. As low earth orbit satellites fly very quickly overhead, the signal will be affected by the doppler effect, thus shifting the frequency as it moves towards and away from you. Tools like this can be used to predict and compensate for this effect and thus providing better signal processing. Meteor M2 is a Russian weather satellite in low earth orbit which transmits digital LRPT weather satellite images that can be received with an RTL-SDR or other SDR. 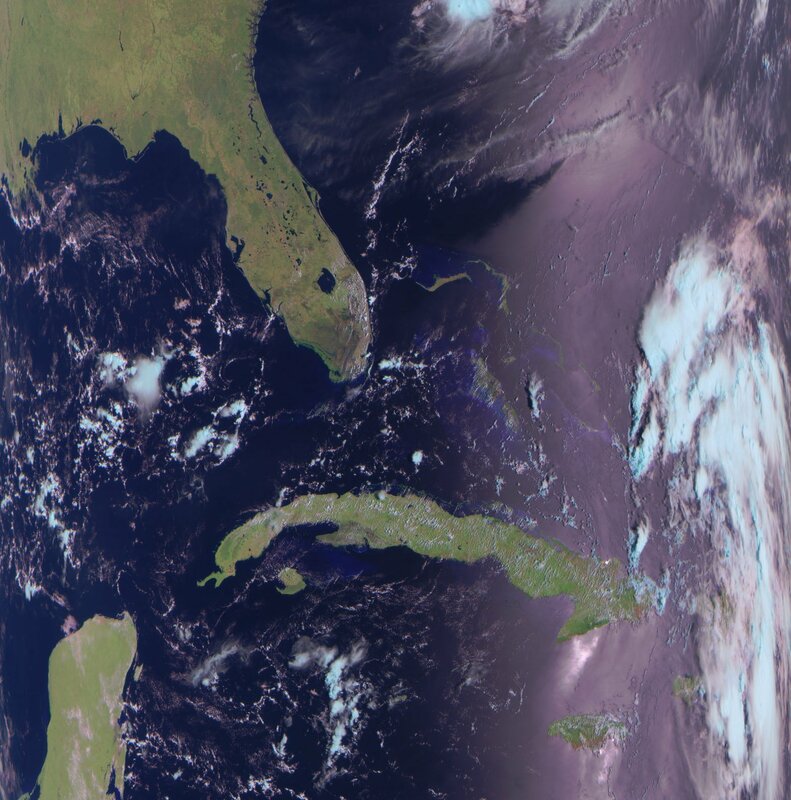 An Example LRPT Image Received with an RTL-SDR from Meteor M2. It dosn´t work.I recieve no Pic´s. I use a RTL Stick what work on the Noaa Satelites. Hello, my problem are that the PI doesn’t begin to decoding because it doesn’t find some file and I don´t understand why? I use a RPI3 with a Terratec USB Stick that work´s for Noaa or with the SharpSDR. The GRC (gnuradio companion) script handles the SDR stuff. You can launch this manually (it’s a python script) to see if you get any more debug information. I would suspect there are some uninstalled dependencies. Preparing a list of instructions starting from a fresh raspbian is on my todo list. I believe it doesn’t extend further than gnuradio and gr-osmosdr. Did you install these? I ran the modified code this morning and it worked like a charm. I committed the changes to GitHub. Thanks! Thanks for replying! I also left a note on Github, since I was trying anyway possible to contact you. At the very least I need any name, date, anything. The no name causes an error for me. I tried the same thing using XMLRPC, for which I did not need to create an OOT module for gnuradio. However, when running my script on a raspberry pi, it would crash as soon as the update rate was faster than 1s. No clue why, on my laptop it would run faster. Does this run on a rPi? Check out my script on github, it’ll download the TLEs for weather satellites, find meteor M2 in there, calculate position (using pyephem) and launch a grc script when elevations are positive, followed by automatic decoding, image processing and distribution to a mailing list. I have an issue with your great meteor RPI program. The attachments that are sent via email have no name. That is causing a problem in the usage I have in mind. Is that correct? Or did I do something wrong? Is there any way toa dd the file name to the attachments?